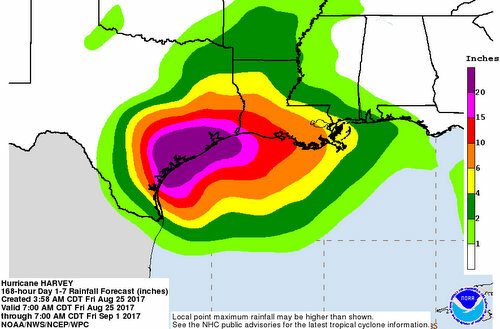 The effects of Hurricane Harvey are beginning to be felt along the Southern coast of Texas on Friday morning, but the National Hurricane Center predicts the system to slowly drift northeast back towards Louisiana into next week, bringing rainfall that could once again test New Orleans’ beleagured pumps. Harvey should draw near to the coast near Corpus Christi, Texas, by Friday evening, according to the 10 a.m. forecast from the National Hurricane Center. Its path will continue northwest into Texas through Sunday, at which time the models suggest it could bend back out toward the Gulf of Mexico again and travel up the Texas coast toward Houston and Galveston, retaining tropical-storm strength even through Wednesday. New Orleans city officials and a National Weather Service meteorologist are expected to give an update on expected effects for New Orleans at 2 p.m. Friday.